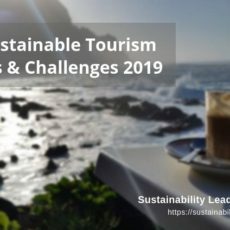 Looking ahead, which sustainability topics and trends do you think will have most impact on the work of tourism professionals in 2018? That’s the question we asked our panel of tourism and sustainability researchers, advisors and managers earlier this year. 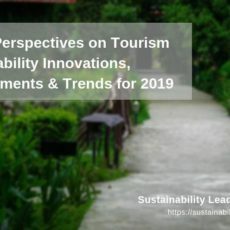 If working in tourism, watch out for the following trends and “hot topics” linked to sustainability, according to the expert panel. Not surprisingly, and in line with our panel’s earlier reflections on the topic, the overwhelming majority of our respondents agree that “overtourism” will continue to be at the core of the discussion in 2018. This is primarily due to the unchanged focus on growth of the main tourism businesses, and record-breaking numbers of international travellers. The increasing discontent of local communities and broad media coverage are generating an almost “enforced” shift to holistic destination management. 2018 will see destinations and businesses focus on increasing visitor profitability, rather than volume. Rachel Dodds [Sustaining Tourism]: “the media attention will not stop anytime soon, which will continue to make its case and open the possibility to shift from ‘destination marketing’ to ‘destination management’”. Shannon Guihan [Bannikin Travel & Tourism]: overtourism is forcing tourism professionals and operators to avoid profitless volume business and seek “quality over quantity”. Our panelists also pointed out that – while not compensating the harm that overcrowding inherently brings to destinations and communities – tourism professionals must seize the opportunity window of media coverage highlighting overcrowded destinations. Likewise, there is much potential in benefiting from travellers trying to avoid struggling destinations and increasingly seeking non-mainstream destinations and transformational experiences. Closely linked to overtourism, the majority of respondents agree that the different “sharing economy” platforms, their impact and responsibility on the industry will be further scrutinized by both governments and communities in 2018. Another growing sustainability factor and topic which tourism professionals must prepare for in 2018 are the increasingly harsh consequences of climate change impacting the industry. Almost 60% of our respondents consider that 2018 will be a milestone year for tourism professionals in this sense. From flights cancelled due to adverse weather conditions, longer and stronger hurricane seasons to destinations more severely affected by natural disasters, such as the California fires, the Caribbean islands hurricanes and South Africa’s water shortage – our panelists consider that the dire consequences of climate change will increasingly affect tourism seasonality, as well as tourism product design. Tourism professionals will need to be more flexible and resilient to maintain quality and competitiveness of their products. Another consequence of the influence of climate change is the growing awareness of the need to adopt responsible and sustainable behaviour for not just production, but also consumption. Travellers are increasingly aware of their environmental footprint and of on-the-ground situations of destinations. This adds to the importance of showcasing and explaining good practices to the public, as well as the importance of sustainable practices for commercial competitiveness – from measurement tools of greenhouse gas emissions to CSR and sustainability certifications. The majority of the respondents consider that in 2018 certifications and verification programmes will gain ground. The prediction of this increased importance for tourism products/services, according to our panelists, can be drawn from two main factors: regulating institutions will implement new requirements for tourism stakeholders and certifications will continue to provide market differentiation (factors of competitiveness). To an extent, it can be said that this trend feeds from some of the other tendencies mentioned above: increased concern from travellers about sustainability, the urgent need to find solutions for overtourism and the increased relevance of responsible corporate citizenship, in the eyes of consumers. Nevertheless, some of our respondents, while agreeing with the increase of certifications in the industry, warn that an excess of repetitive, non-verifiable certifications will create confusion among travellers, even numbness. Finally, the panel of experts pinpoint that tourism professionals must understand that tourism products and destinations failing to tackle environmental degradation in its different forms, will stand to lose in 2018. Travellers today are not only more engaged in sustainable practices and environmental advocacy, but social media platforms will continue to play a crucial role to scrutinize a destination’s tourism capital (in both positive and negative lights); particularly in the case of ecotourism destinations and natural attractions. Moreover, travellers will continue to look for transformative experiences in their holidays that align with their ideals of wellness and sustainability. Not only sustaining but regenerating our ecosystem through tourism, will gain momentum this year. Tourism professionals must, therefore, continue to push and engage for environmental conservation from all angles and communication channels in a coherent manner, and coordinate efforts with other destination stakeholders. We will (hopefully) continue to see an increased advocacy and commitment from users and companies in fighting for animal welfare. 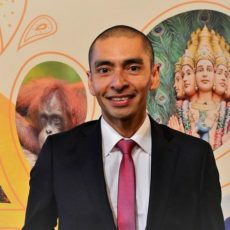 From airlines banning wildlife trophies, Instagram restricting specific posts and hashtags linked to animal selfies and tour operators stopping sales of damaging “animal sanctuaries” and animal parks – this all points to an increased engagement within the industry for sustainable practices to protect biodiversity. 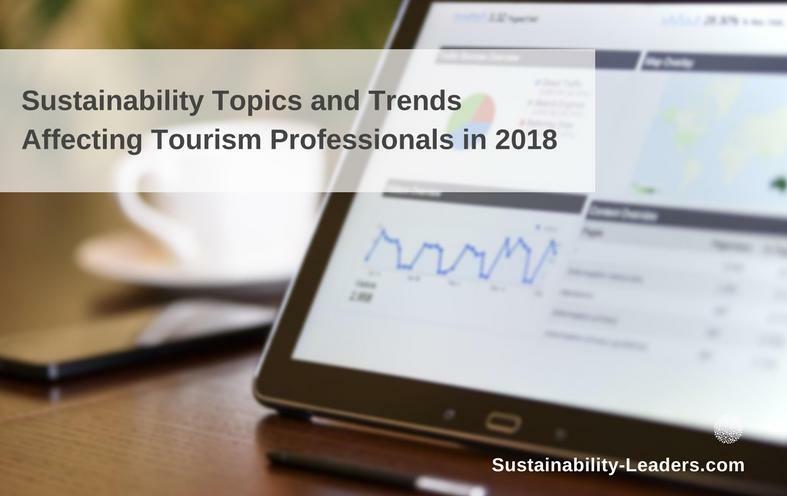 Enjoyed this snapshot of expert views on the main sustainability topics and trends likely to influence the work of tourism professionals in 2018? Share and spread the word!